The movie Burke and Hare: trailer, clips, photos, soundtrack, news and much more! Simon Pegg and Andy Serkis are making a killing! Two grave robbers (Simon Pegg and Andy Serkis) realize that they could make more money from snatching dead bodies to sell them to the local medical school. Burke and Hare – I need to make more money, fast! 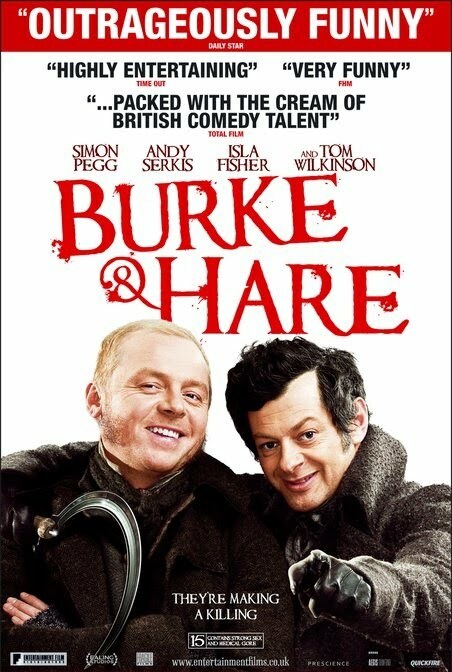 Burke & Hare is a comedic take on the true story of the 1828 Edinburgh body-snatchers William Burke (Simon Pegg) and William Hare (Andy Serkis). These two Irish entrepreneurs, spurred on by a chance meeting with a gorgeous actress (Isla Fisher), discover that a dead body can fetch a hefty price when the demands of the leading medical professors Dr. Knox (Tom Wilkinson) and Dr. Monroe (Tim Curry) reach beyond that of the local supply. Those body-snatchers from yesteryear crack me up! Those two chaps are body snatchers: if you see them lurking around a cemetery, go get the police! The movie Burke and Hare is a horror comedy movie directed by John Landis and starring Simon Pegg and Andy Serkis. Simon Pegg plays as Burke and Andy Serkis as Hare. I can but think that Pegg would have been a better match as Hare though: he isn’t fat enough to play Burke!